Yesterday was a glorious recovery day after the Big Hit Half Marathon. I actually took the day off of everything, including work, because I knew I'd be all tuckered out from running and driving. I spent the day baking, cleaning, shopping, taking a hot bath, reading magazines and going out to dinner at Texas de Brazil. Protein is good for recovery, right? I also got a divine massage from someone who specializes in sports massages. I felt pretty much recovered by the time it was over. 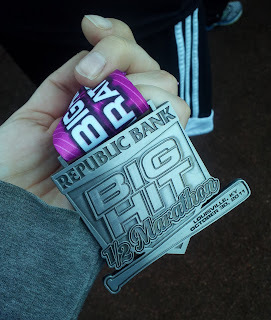 But the whole day to myself really gave me time to think about what my first half marathon means to me. I wore my medal home Sunday and the cashier at Taco Bell asked me if I won (Taco Bell is my constant. Don't judge.). I may not have won, but it didn't matter. This medal is precious to me, just like all my other medals. I earned this medal just as much as any winner did. I earned this with every mile I didn't want to run, but pushed through it anyways. I earned this with every 5 a.m. wake up call, every run I completed while my town was still asleep and my path was illuminated by oncoming headlights. I earned this when it was 90 degrees at 6 a.m., and I was still out there, pounding the pavement. I earned this with every cat call, every car horn honk and every car that veered at me, instead of away from me. I earned this with every lonely mile I pounded out in silence, wondering what my friends were up to or what I was missing alone on the road. I earned this with every drink, meal and treat I passed on in the name of improving my performance. I earned this with my foot strikes, pulled muscles, set backs, sacrifices, challenges and triumphs. What is with drivers swerving toward runners? I had one do that to me a few weeks ago; they even through something out the car at me. LAME. your determination is impressive! you totally earned it! !